Greetings, Stuffies! We've been really excited to see all the great feedback and stories of players exploring and battling the forces of Crepitus in Stuffed Fables! We're very pleased to see that the game has done so well with Gamer Parents and their children, but we've also noticed that more seasoned gamers have been asking for a greater challenge. In order to provide an even tougher experience for those players, we're proud to announce Seasoned Stuffies, a collection of variant rules that any group can add to their game to ramp up the difficulty! Stuffing Shortage reduces the number of White Dice available in the bag, making it much harder to recover from attacks. Persistent Threat slides unused threat dice up the track, letting enemies activate again even sooner. Tough Bosses lets the big bads of Stuffed Fables start with 1 or 2 additional dark stuffing for an even greater challenge. Unlucky Stuffies have to deal with fewer purple dice available in the dice bag. These are just a few of the variants covered in Seasoned Stuffies. There are even more to ramp up the difficulty and each one is explained in detail here. Good luck to all the players seeking an even greater challenge! We're excited to hear your stories and triumphs as you explore the Seasoned Stuffies Rules Variant. 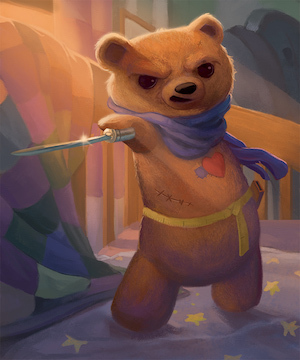 Your feedback on Stuffed Fables has been instrumental in letting us provide more content to Stuffed Fables, so be sure to let us know exactly what you think of this and other Stuffed Fables Supplements! You can download the Seasoned Stuffies Rules Variant here. Also, don't forget to download Stuffed Fables Lost Story 1.